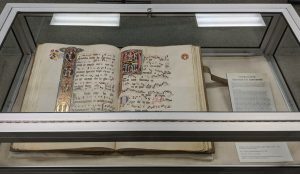 The Seton Hall University Archives & Special Collections Center is currently exhibiting two recently acquired high quality facsimile volumes of the original Book of Kells and The Gradual of St. Katherinenthal donated to our institution through the generosity of Mr. Peter Graham. These works each have a distinguished history both in terms of literary content and aesthetic value which allows our community the opportunity to view and study copies of these editions in close detail. According to scholars, this work was created around the year c. 800 AD and produced through the artistry of a triad of unidentified Columban Monks. The Book of Kells is most famous for its ornate illustrations. Abstract designs and images of plants, animals and Biblical figures not only serve the purpose of glorifying Jesus’ life and message, but also constitute a rich symbolic system in themselves. Symbols of the evangelists Matthew (the Man), Mark (the Lion), Luke (the Calf) and John (the Eagle) adorn related sections of the text; in addition, there are full depictions of the Virgin and Child; a portrait of Christ, and complex narrative scenes, which were the earliest to survive in gospel manuscripts, representing the arrest of Christ and his temptation by the Devil. The text grew increasingly well known throughout the nineteenth century. It is thought of as one of the central artistic works of Celtic culture, and a source of national pride for Ireland. The text proper includes the Gospels of Matthew, Mark, Luke, and John from the Vulgate (Latin translation) version of the Bible as translated by St. Jerome, and also contains texts from an earlier Old Latin translation featuring more specialized religious texts. It was only brought to the altar a few times per year and only during important liturgical events within the Church, especially the Easter Vigil. The book remained in Kells until 1654 when the original was moved to protect it from the invading armies of Oliver Cromwell and transferred to Dublin and the Library at Trinity College where it remains on display to this day and seen by upwards of half a million visitors per year on average. This facsimile edition was produced with scrupulous attention to detail, hand-sewn, and compared against the original by an expert at Trinity College, Dublin. At present, approximately 81 other libraries across the globe own a copy. The original has been completely digitized by Trinity College and made available to the public free of charge. Gradual of St. Katherinenthal, Upper Rhine, 1312. (Fine Art Facsimile Volume No. 729). Duft, Johannes, (Faksimile-Verlag, Luzern: 1980). The Gradual of St. Katherinenthal is a collection of church hymns, which were recited by the Gregorian choir during mass in the 14th century. The sheet music is embellished with brightly colored pictures backed with the finest gold leaf. The work is widely regarded as the finest example of Gothic book art in the world. The unusual size is meant to allow all the singers of the choir, even those standing further away, to easily read the pages. The book opens with two pages that contain calendric information. The following pages contain musical scores in the Gregorian four line system, that each incorporate staves and lines of text. The book includes 71 elaborately designed miniatures with gold decoration, 13 flowers painted to form letters, and a considerable amount of calligraphy. The origin of the gradual from the St. Katherinenthal monastery and its time of creation, circa 1312, is recorded in handwriting on the inside of the front cover. At least six artists were involved in the creation of the work, but their names were not recorded here. 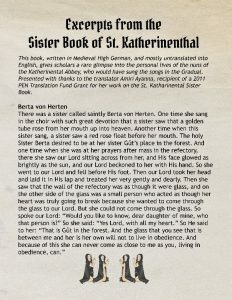 The St. Katherinenthal Abbey was a monastery of Dominican nuns located near Lake Constance, Switzerland, and represented one of the oldest communities of nuns in that part of the world. The original Abbey, along with the town, was burned to the ground in 1388, but was rebuilt in the beginning of the fifteenth century. 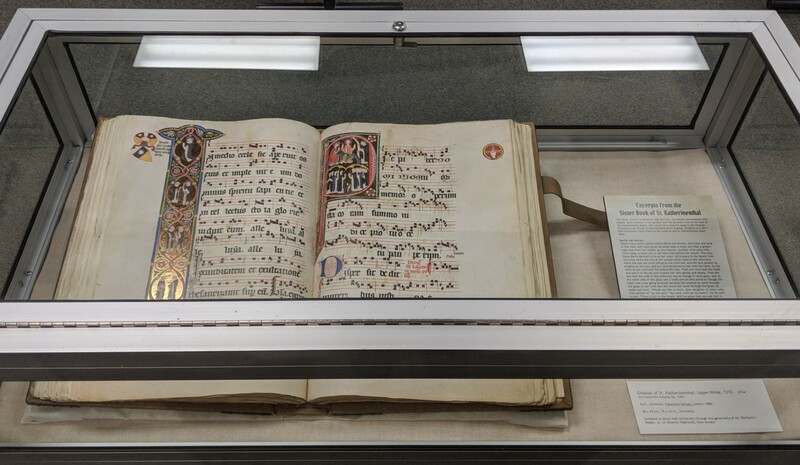 The community was exceptionally well-documented for that time period, and we have personal stories of many of the nuns recorded in the “Sister Book” of the Abbey. 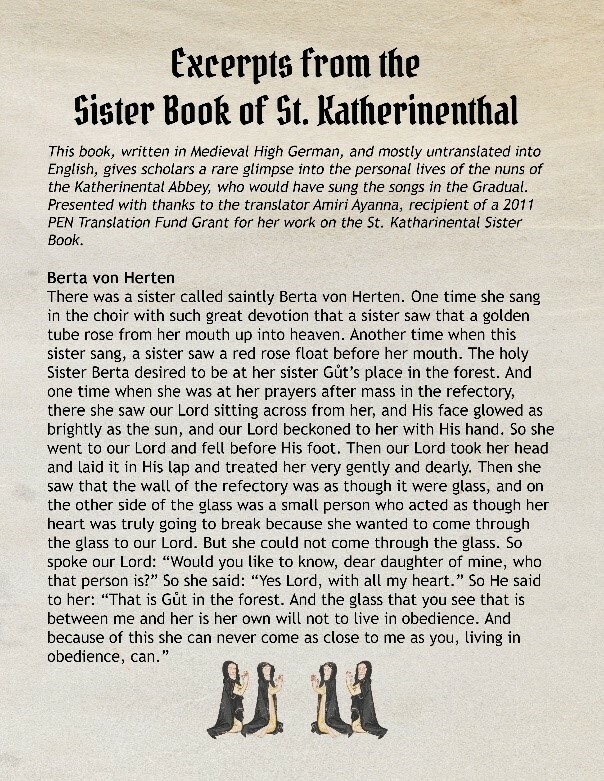 This is one of the stories written by the nuns who would have sung the songs in The Gradual of St. Katherinenthal. This book, written in Medieval High German, is being translated by Amiri Ayanna, a project for which she won the PEN translation award in 2011. These stories give a window into the world of the nuns of that day. Today the Abbey continues to operate in what is now the town of Weesen, and runs a bakery that produces Eucharistic breads, as well as a guesthouse. 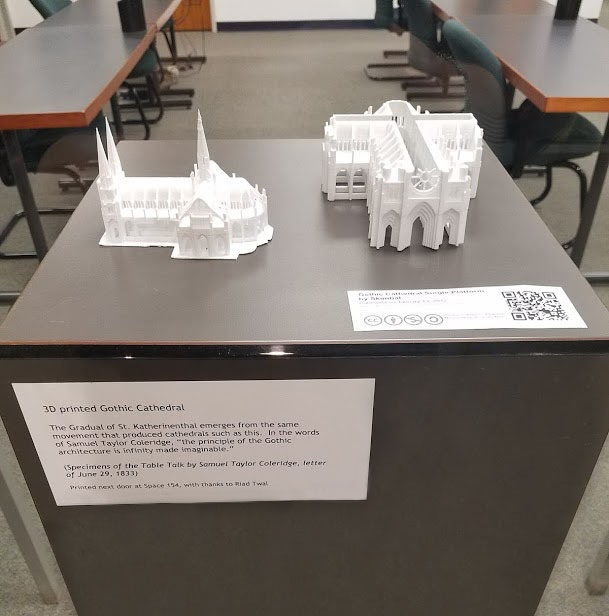 The exhibit also features a 3D printed Gothic cathedral, to give a richer sense of the aesthetic that produced the gradual. The cathedral was printed at Space 154. For more on rare books at Seton Hall, see our LibGuide.